South Beach stole my heart this week, somewhere between the massive sprawling palm leaves, aqua waters and white sand. The pastel Art Deco architecture is worth a photo on every block. Ridiculously fun and over-the-top nightlife adventures cap off each day. Current bestie/biz partner Krystal and I met up with my best friend from high school, Marisela Estevez, founder of Alteria, who showed us a secret pizza joint and made us laugh until we cried. 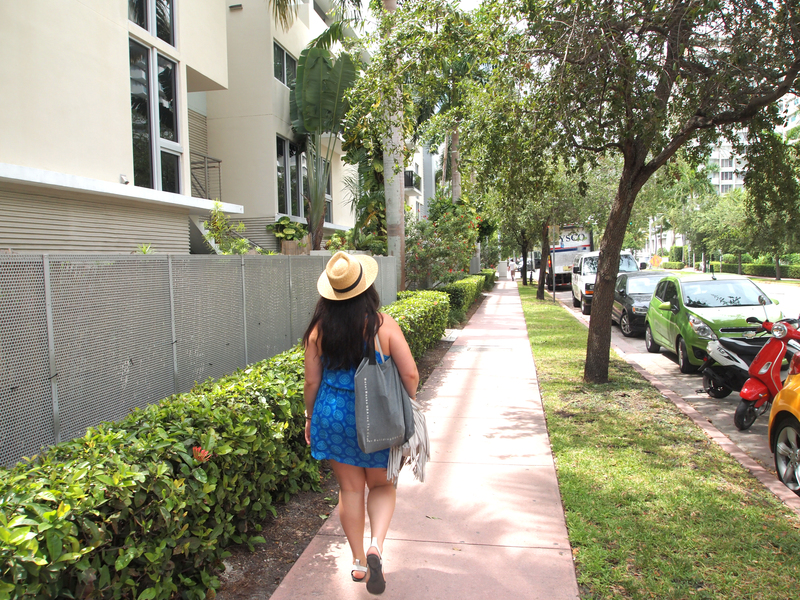 I also had a chance to link up with South Beach local and fellow freelance writer, Nicole Martinez, who instantly became one of my favorite people. Did we experience the “authentic Miami”? Definitely not! Turn away now if you’re looking for anything but eye candy. ;} Next time we’ll get into the good stuff and actually explore what the city has to offer. This time we were content to be sun-worshiping tourists, but we had a blast, and I documented it. Believe me when I say nothing speaks to the vibrancy of South Beach like a few delicious vacay snaps… so I’ll let them do the talking! Most crucially during this trip, Krystal and I put the finishing touches on the launch of our website, Day Job Optional, which will mentor aspiring writers to take their careers online and become completely location independent. We took every possible opportunity to celebrate this fact! By the way, in South beach, “low season” is really low. Locals told us that iconic restaurants routinely go out of business, taxi drivers can’t make fares, and businesses shutter constantly during this span of three or four months (high summer to late fall) when south beach is empty. The locals must love it, because the streets are pretty empty. However! If you’re into hot, humid temps and cheaper flights/accommodations, this is the time to go. Buckets of grapefruit beer is the way to go if you’re parking it in the sun for a few hours of work. 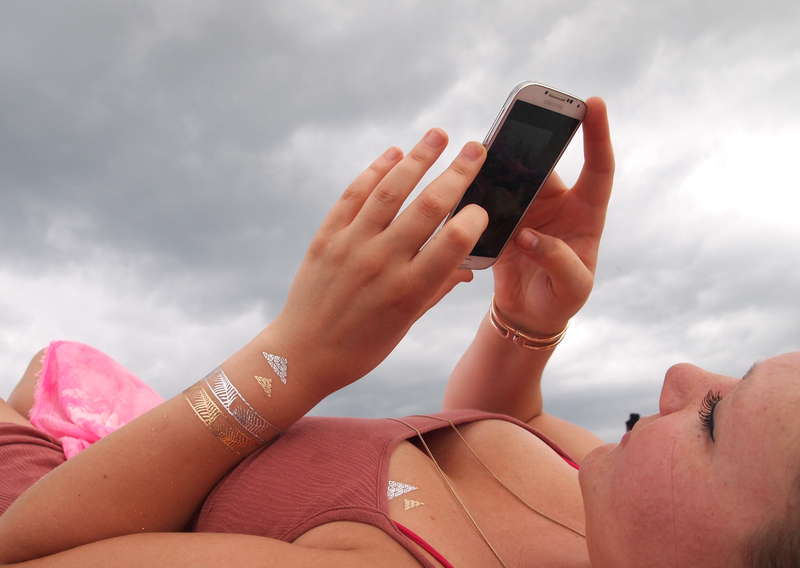 Flash tattoos… because they look better in Miami than New York! Why do I love the sight of condos and palm trees so much? We really loved this little joint near our hostel, Burger Taco Whiskey, but it seems it has since succumbed to the off season business shuttering syndrome that so many businesses fall victim to! Sad face. If you want exploding confetti canons and bikini-clad girls dancing on mini-stages in clubs the size of stadiums, this is your place. I mean, come on. It’s South Beach, you might as well go all out for a night or two! Just don’t forget your credit card. You won’t be finding any cocktails under $20 at tourist-tastic spots. Find girls on the beach with clipboards who are signing people up for nightlife packages at one of South Beach’s many famous clubs. You won’t be hard pressed to find a $30-per-person package that includes a bottomless vodka open bar and a limo to the club of your choice. Again, cheese factor? Way high. But so worth it for the laughs and good times! Just by chance, we saw Public Enemy live on Friday night after a series of serendipitous events that ended in us standing front row for an epic performance. Chuck D even took Krystal’s phone to take a selfie of himself. Mornings, we parked ourselves at Starbucks to get some work done in the AC. It is literally hot AF in July. There’s a reason all of South Beach is empty! Sweet vintage complexes like this were literally everywhere. Yes, I got on craigslist and looked up apartments. Rent is cheaper than Brooklyn right now… and it’s like living inside a Barbie cartoon from the 80s! People who live in Miami are rolling their eyes at me right now. I have no chill and I love colorful buildings. 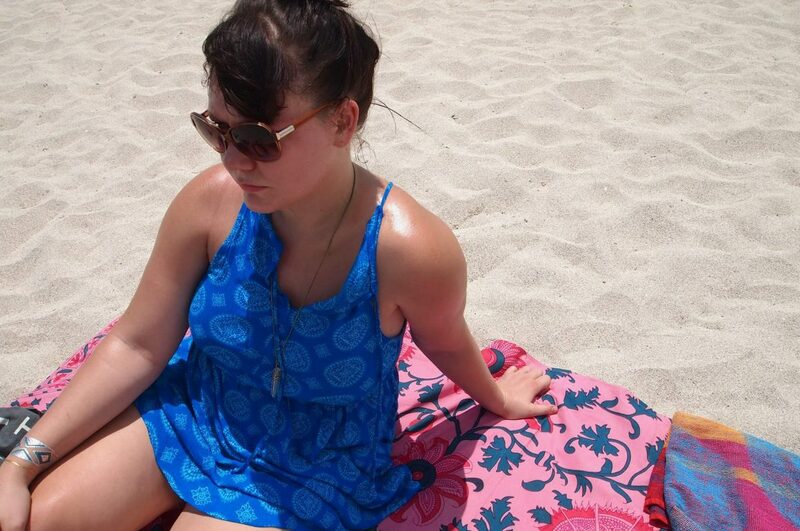 On the beach, you can leave your umbrella at home and rent one for about $10 bucks. Check the weather, though. If a random storm rolls in as they frequently do in the afternoon, you won’t get a refund if you have to run from the sand. Props to South Beach for being so aesthetically minded! The beaches look gorgeous with white and blue fixtures. This Neapolitan pizza place that my friend Marisela showed us was located inside an office building, and it was packed even during the low season. Can you see why? The food was insane. 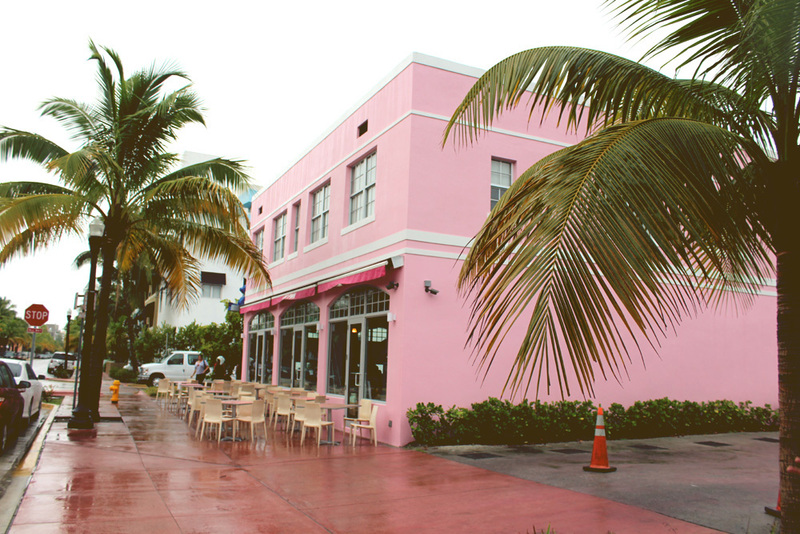 This place is called Mister 01 and their sneaky South Beach location is a little tricky to find… but if you’re determined, you’ll get there! The number of times my friends had to call me away from photographing palm trees got kind of embarrassing. But everything looks like a postcard! Here’s a tip I learned quickly: When it rains, it floods. Much of South Beach is situated below sea level, and its not unusual to see cars driving through rivers on the street when your daily afternoon monsoon comes rolling in. Speaking of storms, get the hell off the beach if one is coming! K and I thought it would be harmless and kind of fun to hang around to watch the stormy waters. There is a hysterical video that will never be published of us trying to talk to the camera while the storm transitioned from rain shower to monsoon. At one point we got pelted with sand so intensely it felt like little shards of glass. Much screaming and swearing ensued. Overall, it was a blast, and I can’t wait to go back for more beach lounging, to try all of Nicole’s lesser known Cuban restaurant recommendations, and get into the heart of the city! Got your own tips about lounging in South Beach? Drop them in the comments!